The comprehensive range of 210 ml Tea Paper Cup that we offer is fabricated from premium-quality paper sourced from reliable paper suppliers. These plain paper cups are eco-friendly and biodegradable and can be used for recycling process. 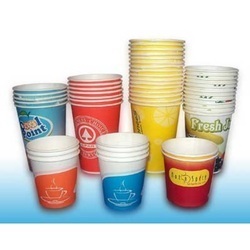 We offer a great variety of Tea Paper Cup that our clients have been using with great satisfaction. The cups are processed from ITC Paper which is of the most exclusive quality. The paper thickness is 185GSM that makes the cups very strong to hold. These can hold different kinds of potable liquids, ideal for parties and other large occasions. We can offer in large quantity. Looking for Tea Paper Cup ?